BJP president Amit Shah filed his nomination papers from Gandhinagar for the Lok Sabha elections 2019. Amit Shah has been nominated by the BJP for the Gandhinagar Lok Sabha seat. BJP president Amit Shah filed his nomination papers from Gandhinagar for the Lok Sabha elections 2019. Home Minister Rajnath Singh, Finance Minister Arun Jaitley, Shiv Sena president Uddhav Thackeray were among the top BJP leaders who accompanied him. Top leaders, including union ministers and many NDA allies, had shared stage with Mr Shah at a public meeting in Gandhinagar this morning and then held a road show through the city. Mr Shah, who was elected to the Rajya Sabha from Gujarat, has been nominated by the BJP for the Gandhinagar Lok Sabha seat. Mr Shah is replacing BJP veteran L K Advani, who had been winning uninterrupted from Gandhinagar since 1998, from the prestigious constituency. Bharatiya Janata Party (BJP) President Amit Shah holds a road show in Ahmedabad. Today is a big day... I stand here today before filing my nomination from Gandhinagar. If you take out BJP from my life, you will be left with zero/nothing (shunya). I am blessed that I am getting to contest from the very seat from which veteran leaders like Atal Bihari Vajpayee and LK Advani stood. This is an honour for me. I have come here to congratulate Amit Shah on this significant move. He is going to contest from the seat where our veteran leader LK Advani used to contest. This is a big move, and I am sure Amit Shah will live up to the expectations of this constituency. Both NDA and BJP had achieved a full majority in the 2014 polls. We still took everyone along. Our allies being present here is a sign that come-what-may, we stand together. And people like Rahul Gandhi say 'Prime Minister Chor Hai'? I appeal you all to come together and convey a message to Rahul Gandhi that "Pradhan Mantri chor nahi hai, pradhan mantra pure hai"
If Indira Gandhi can get credit for dividing Pakistan, why shouldn't PM Narendra Modi get credit for Balakot strike, asks Rajnath Singh. Shiv Sena chief Uddhav Thackeray said that people must be surprised to see me at Amit Shah's rally. Uddhav Thackeray said that there was no opposition which could give enough competition to the BJP in the Lok Sabha elections. 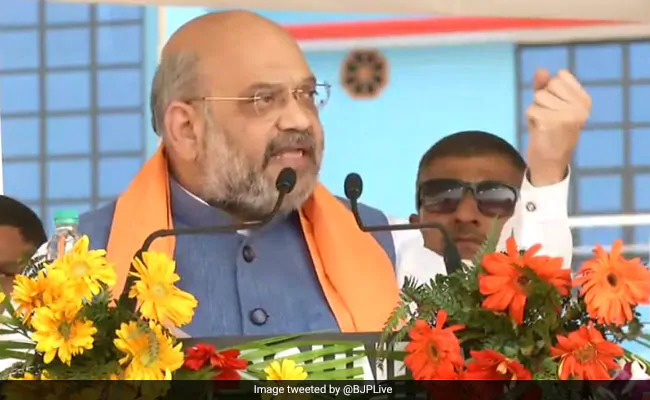 BJP President Amit Shah pays tribute to Sardar Vallabhbhai Patel, he will file his nomination for Gandhinagar parliamentary constituency today. BJP president Amit Shah is set to file his nomination from Gandhinagar for the Lok Sabha elections 2019 today. 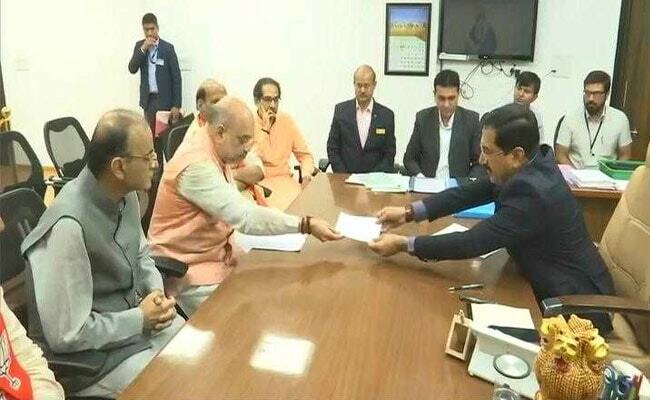 Home Minister Rajnath Singh, Finance Minister Arun Jaitley, Union ministers Nitin Gadkari and Smriti Irani are among the top BJP leaders who will be accompanying him for his nomination filing.